Turboexpanders and Process Applications offers readers complete application criteria, functional parameters, and selection guidelines. This book is intended for the widest possible spectrum of engineering functions, including technical support, maintenance, operating, and managerial personnel in process plants, refineries, air liquefaction, natural gas separation, geothermal mining, and design contracting. The text distinguishes between cryogenic turboexpanders that are used to recover power from extremely cold gases, and hot gas expanders that accomplish the same objective with gases reaching temperatures in excess of 1000 degrees Fahrenheit. 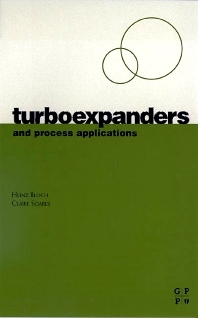 The authors have assembled in this book an optimum combination of process and mechanical technologies as they apply to turboexpanders. A consulting engineer residing in Montgomery, texas, Heinz. P. Bloch has held machinery-oriented staff and line positions with Exxon affiliates in the United States, Italy, Spain, England, The Netherlands, and Japan. His career spanned several decades prior to his 1986 retirement as Exxon Chemical's regional machinery specialist for the USA. Since his retirement from Exxon, he has been in demand throughout the world as a consultant and trainer in the areas of failure avoidance, root cause failure identification, and reliability improvement. Mr. Bloch is the author/co-author of thirteen books and over 200 other publications on subjects related to machinery reliability and failure avoidance. He is the Reliability and Equipment Editor of Hydrocarbon Processing magazine and has served as chair of the annual conference program for Hydrocarbon Processing's Process Plant Reliability Conference for a number of years. Claire Soares is an ASME Fellow and industry consultant with more than 20 years’ experience at such leading manufacturers of gas turbines as GE and Rolls Royce. Claire is a recognized turbomachinery specialist with particular expertise in optimal design selection and specification, and ensuring long-term successful operation for a given application.